I have the KitchenAid stand mixer. It makes baking a breeze. You can also buy attachments for ice cream-making and meat-grinding. 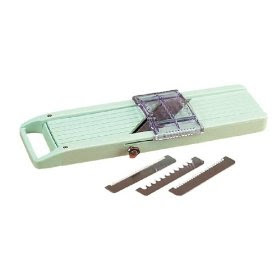 A mandoline is great to have for slicing potatos and vegetables for gratins. 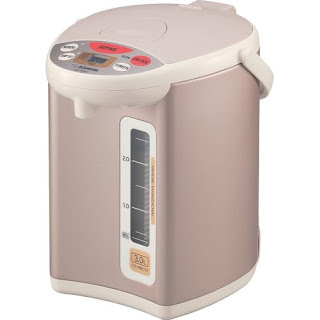 A rice cooker is, to me, not worth it. As you said, you make small portions on the stove. You could probably make rice porridge in a slow cooker, a more versatile small appliance I'd recommend. Hot water pot doesn't seem worth it. But get one or two madeleine sheets. They don't take up much space in a cabinet, and if you like to make madeleines, indulge! I really want some good enameled cast-iron dutch ovens. Melissa, watch Amazon for a good deal on a Staub or Le Creuset. I got my first enameled dutch oven (well, Staub calls it a cocotte but same thing) last year and it is, BY FAR, my most loved pot. Kitchenaid, check. I use mine every week, and have the pasta, and meat grinder attachments. I don't even own a hand mixer, just KA and my whisks. I have a zen thing going on with rice: for some reason I can cook rice--any kind of rice, from brown to long-grain to sushi rice--absolutely perfectly, every time, so it would be wasted on me. Also, rice cookers are too single-task for my taste. Mandolins are good if you're doing vast amounts of garnish, but for actual food-prepping tasks you'll get more mileage out of a decently sharpened French knife. Of course you need Madeleine pans! How else will you make me Bergamot Madeleines when I come over? The Kitchenaid is out for me, mainly because I have very little counter space and it would be more trouble than it's worth. I seldom bake, although I love the idea of making fresh pasta. I make white rice in the microwave, brown rice on the stove. I got a rice cooker for Christmas and it just doesn't seem worth it for a small serving of white rice; it burns brown rice every time. I absolutely adore my Mandolin! I do not have great knife skills, so when I want paper-thin slices of celery for a salad or a chiffonade of brussel sprouts for stir fry, it is invaluable. I got mine on Amazon and it snaps onto a mixing bowl, so it does double duty. Love it! The hot water dispenser seems pretty cool! I want an electric kettle, and that would be even nicer. My Kitchen Aid was a gift so I did not purchase it myself (it would probably take me five more years to find the justification for such a purchase), but I love it. I have the pasta attachments, which I use more than anything else, but it is a dream for baking too. As far as your counter space concern, I see the Kitchen Aid as decoration. They're beautiful, aren't they? The stand mixer is an awesome idea if you have the counter space to keep it out. I bet you'd use it a lot less if you had to pull it down from a shelf or up from a cupboard, though. I'm thinking of one too--my ancient hand mixer gave up the ghost (or smoke, rather) last weekend. 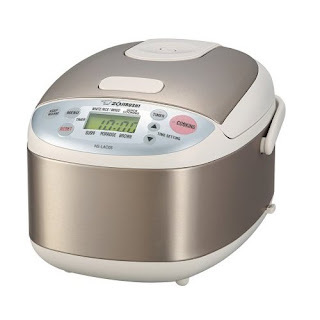 The rice cooker I would skip. I got one from my wedding, and I do use it, but basically just to keep the stove more clear to cook on. Rice is so easy to cook yourself, and if you decide you want boiled rice Indian style instead of steamed, you'd have to cook it on the stove anyway. I am intrigued by the mandoline-have never used one, but I find slicing vegetables uninspiring rather than meditative. Bergamot madeleines sound amazing, and you can hang that gorgeous pan on the wall if you tire of making them. If you do a lot of baking, the kitchen aid is a must. And, the pasta attachment for it rocks! It makes better pasta than a pasta machine. So thinly and evenly rolled, you can almost see through the sheets of pasta! Carmelo got a Mandolin, but we hardly ever use it. A good knife is so much quicker and easier to clean up. Tim, you need to get here so I can make them for you. And bring me a bergamot, while you're at it. Lisa, I'm starting to hear that kettle is the way to go. flojindamesa, you're right about decoration. They are incredibly beautiful. It sounds like I should seriously consider and KA savings fund. Lola, pan on wall! You are brilliant. Katrina, your insight is so valuable! I love that you have real life experience with the zojirushi. I have a feeling that I would feel the same way about the mandolin. Knife does seem much quicker and more versatile. I don't bother with a rice cooker for regular size portions (though I do own a big ol' one for large gatherings). The OXO mandolines (or Benriner brand) are inexpensive and work well (around $20 at TJ Maxx). 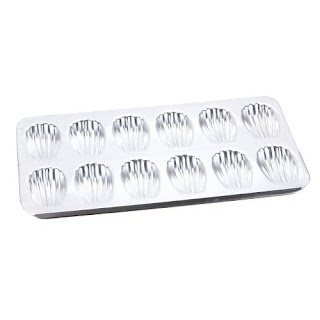 Madeline pans--I don't make madelines, but I will probably buy some eventually when I see some on sale. Now my KA mixer--that's another story. It is used weekly. Shop carefully on Amazon or at BB&B, and you can get a big 5 quart one for around $200...get the bowl-lift mechanism, not one of the tilt-head (lower powered) models. I own the meat grinder, which I rarely use. The beater blade is an essential accessory---it scrapes the sides of the bowl as it stirs. Celeste, that's exactly what I'm going to do (troll Amazon, etc for a good deal). Yesterday, I was given a glorious recipe for a particularly good Meyer Lemon Tart. I was so excited! The first thing it required for the dough was stand mixer with paddle attachment. Foiled again! I've got to get one. 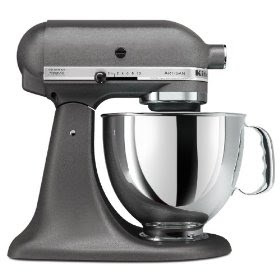 Amazon will sometimes sell refurb KitchenAid stand mixers. I like to watch SlickDeals.net for those pricier items. As far as the two zojirushi items, I actually got one of their top end 10 cup rice cookers for Christmas and it is pretty fantastic. It actually takes a lot longer than my previous $30 model, but there's so much more room for precision. If you're looking for one as small as 3 cups, just remember they use 6oz as cup, not 8. Like you, I'm trying to justify one of those hot water pots. Unfortunately, I can't get past the fact it takes 2 hours for the water to come to temp, so I just stick with a standard water boiler for my tea. @Cynical: I'm pretty sure it shouldn't take 2 hours to heat... more like 10 minutes (according to my friend who has one) and then it stays hot indefinitely. Maybe you're talking about one with a larger capacity? Good note on the cup sizes! I'll keep that in mind in the future.